Siesta Key fishing charter is $400 for 4 hours, 1-4 anglers. Visitors to Sarasota often choose fishing Siesta Key as an activity to enjoy. Action and variety please anglers of all ages and experience levels. 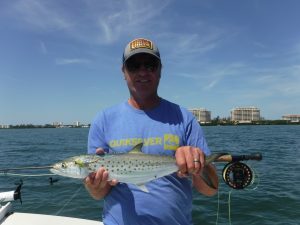 Capt Jim Klopfer offers Siesta Key fishing charters to anglers fishing Siesta Key in Sarasota, Florida. Siesta Key is a barrier island near Sarasota, Florida in the Gulf of Mexico, an hour south of Tampa. While famous for it's white sand beaches, visitors fishing Siesta Key enjoy fantastic angling opportunities all year long. The best way to experience this action is to go out with a professional captain. Captain Jim Klopfer is out on the water over 200 days a year and has been guiding anglers in Sarasota since 1991. Clients going out on fishing charters do very well on a variety of species using multiple techniques. Many of my fishing charters involve families and children. Kids are great fun! Capt Jim loves the enthusiasm and for many clients, saltwater fishing is so different from what they are used to up home in the midwest. Action can be fast and furious with several different species being landed on most trips. Techniques and tactics are catered to the experience level and desires of the client. Live bait is used with kids and when conditions are best suited for that. Lures, especially jigs, are also very effective and are easy to use. Most novice anglers will be casting well and catching fish after just a short lesson. Most of the anglers fishing Siesta Key use light spinning tackle. The grass flats surrounding Siesta Key are shallow and open; the use of heavy tackle is not required. Live shrimp and small bait fish account for a lot of fish for clients. Artificial lures such as jigs and plugs also fool a bunch of fish. The simple lead head jig with a soft plastic trailer work very well most of the year, especially when the water is cooler. Live bait does perform well in the summer. Catching a well full of live bait and using them as chum to attract fish to the boat is a proven technique in Sarasota Bay. Fly anglers are not to be left out, as any species that will hit a jig will also take a well presented fly. Big Sarasota Pass borders Siesta Key to the north and holds mackerel, bluefish, pompano, and ladyfish. 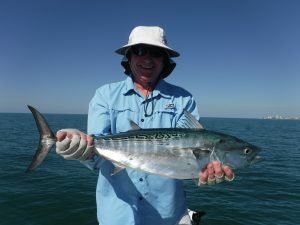 Drifting the pass with live bait and artificial lures is a productive technique that is a great option for anglers fishing Siesta Key. Clients drop a jig down to the bottom and bounce it sharply as the boat drifts over the sand. Live shrimp are fed out behind the boat. Fish school up in large numbers at times and provide fast fishing! Pompano are targeted, as well as Spanish mackerel, bluefish, jacks, and ladyfish. Structure in Big Sarasota Pass holds sheepshead and snapper; both being both great sport and table fare. Late winter and spring is a great time to catch sheepshead. They school up in the rocks to spawn. I live shrimp fished on the bottom near the rocky structure will fool them. Snook will also stage in the deep structure in the summer time. 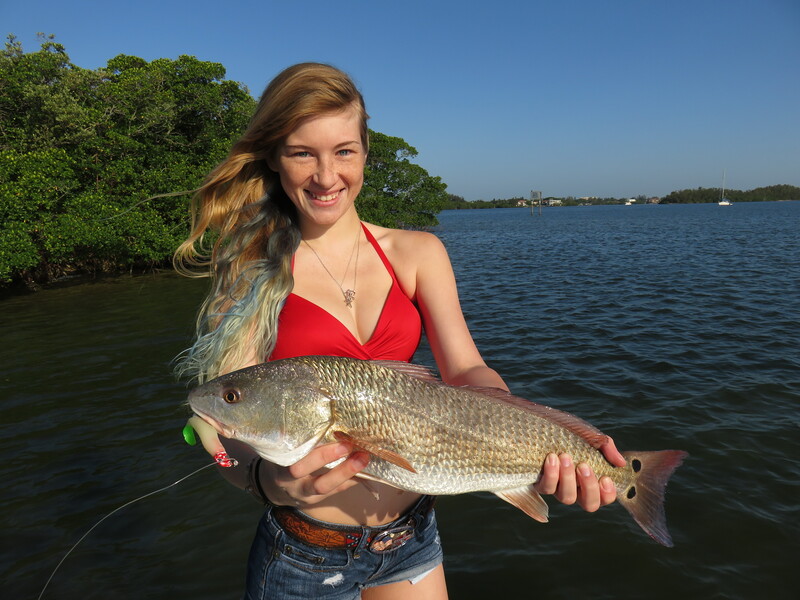 Lush grass flats surround Siesta Key and offer great fishing! 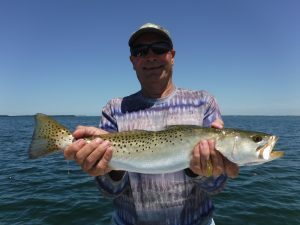 Speckled trout are very popular, but Spanish mackerel, pompano, cobia, bluefish, jack crevelle, sea bass, grouper, snapper, flounder, ladyfish, and more are common catches throughout the year. 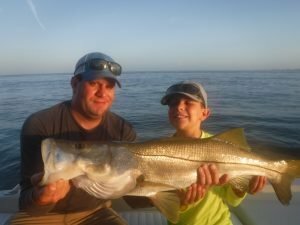 Drifting the grass flats in 5' to 10' of water and casting jigs or live bait is by far the technique that is employed on the majority of Siesta Key fishing charters. It produced both action and variety for clients and is easy for novice anglers to do as well as the more experienced ones. There are many days when artificial lures produce more fish than live bait does. This is particularly true in the cooler months. Chumming with live bait fish is very effective in summer. Live shrimp produce all year. Oyster bars and mangrove shorelines dominate the backcountry portions of Robert’s Bay and Little Sarasota Bay. Snook, redfish, trout, and jack crevelle thrive in this habitat and readily take a live or artificial bait. 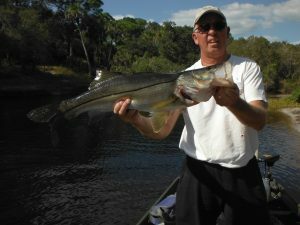 Snook in particular are a highly sought-after species; it is the premier inshore gamefish in Florida. Snook are similar to largemouth bass, they are "ambush predators" and take up station in a spot that will allow them to easily catch their prey. Mangrove points, bars, docks, and other structures hold snook. Refish, large trout, jacks, snapper, and other species will and other species will be encountered in the same areas. Most of this type of fishing is done using artificial lures. Lures allow anglers to cover a lot more water than they can with live bait. Rapala plugs, Bass Assassin jigs, and weedless spoons are the top baits. I will certainly anchor up and fish docks with live shrimp or bait fish as well. When the water temperature in Sarasota Bay drops into the low 60's, snook and jacks will move up into creeks and residential canals. Phillippi Creek is a proven hot spot. The beaches along Siesta Key provide great action as well. Surf casters do well on whiting and pompano using live or frozen shrimp fishing Siesta Key. Jigs, spoons, and plugs will also catch fish. Spanish mackerel, false albacore, sharks, and other species move through in the spring and again in the fall. These "pelagic" species are great sport on both light spinning tackle and on fly. When the winds are light and the bait fish move in close, the fishing can be nothing short of fantastic! If that is not enough, giant tarpon migrate through the area in summer and offer world class angling to those willing to take on the challenge! Sight casting to schools of "breaking" fish is very exciting! It can truly be a fishing frenzy as mackerel and false albacore terrorize helpless bait fish. Just about and bait, lure, or fly that gets close to the fish will be destroyed. Sharks will hover nearby and will hit a bait fish or chunk of cut mackerel. We are blessed in Florida with a wide variety of angling options, but river fishing is my personal favorite. The solitude, scenery, and wildlife are worth the trip alone, and the chance to land trophy fish casting artificial lures on fairly light tackle is just icing on the cake. Best of all, this method is pretty simple and straight-forward for anglers willing to put in a little time and effort. The west coast of Florida from mid-state south has a myriad of rivers, creeks, and canals that hold snook. These can be productive all year, but I focus on them in the cooler months. Snook will migrate into these areas in the winter to escape the harsh conditions on the flats. Most rivers have deep holes, warmer water, and plenty of forage. As an added bonus, largemouth bass are fairly numerous and will be caught using the same lures and techniques. Juvenile tarpon, jack crevelle, catfish, and gar are also common catches. There are several advantages to fishing rivers. Unlike vast open waters of bays and lakes, the fish are relatively confined into a smaller space. They will migrate up and down river, and only time on the water will give anglers the experience that is required to score on a consistent basis. Another advantage, and one that I have used as a fishing guide, is that rivers offer protection from high winds that frequently occur in the winter. In fact, these are often the most productive days to fish. Lastly, fishing pressure is usually very light. I choose to fish with shallow diving plugs in rivers, they cover a lot of water, hang up infrequently, and the hook-up ratio is good. In the tannin waters, I have found gold/black and Firetiger to be the most consistent producers. Often times the fish will hit on the pause as the bait just hangs there motionless, seemingly helpless. I like a 7’ Medium action rod, a quality spinning reel with a good drag spooled with 40 lb braided line with a 24” piece of 40 lb fluorocarbon leader. The best spots in most rivers will be the outside bends. Choose a stretch of river that has twists and bends; that will generally be better than those with long straight sections. Current flow will gouge a deep hole and concentrate fish. Add in some cover such as fallen trees and the result is perfect structure to hold a trophy fish. Depth is critical in river fishing. Most Florida rivers will “undulate”. Two stretches of bank may look the same, but if one has 18” of water and the other has 6’, the latter will produce much more consistently. This depth change will usually not be apparent from the surface, so a bottom machine will help in locating the more productive stretches. Q: Do visiting anglers fishing Siesta Key need a fishing license? A: Most out of state anglers fishing from shore, bridges, or boats do need to purchase a fishing license. The exeption to this is when fishermen visiting Florida go out on a fishing charter. The state of Florida required all charter boat captains to purchase a license which covers their clients. This is a very convenient, saving anglers the time and expense of buying a license in the morning before a fishing trip. 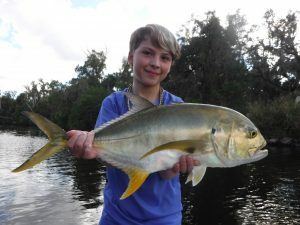 Anglers who would like to review Florida fishing regulations and/or purchase a license can do so at the FWC site HERE. Q: Where are the best spots when fishing Siesta Key? A: Siesta Key offers both anglers from shore and those with a boat the oportunity to catch fish. All of the Siesta Key beaches can be productive at one time or another. Both bridges going to Siesta Key hold fish all year long. Anglers with boats do well in Big Sarasota Pass and on the grass flats throughout the area. Docks also hold a lot of fish. Click HERE to view a detailed fishing map of Capt Jim Klopfer's favorite spots. Q: What species are caught when fishing Siesta Key? A: One of the great aspects of fishing Siesta Key is the variety of species that are landed by both local and visiting anglers. The mighty tarpon is caught off of Siesta Key beaches. Snook are the premier inshore game fish. 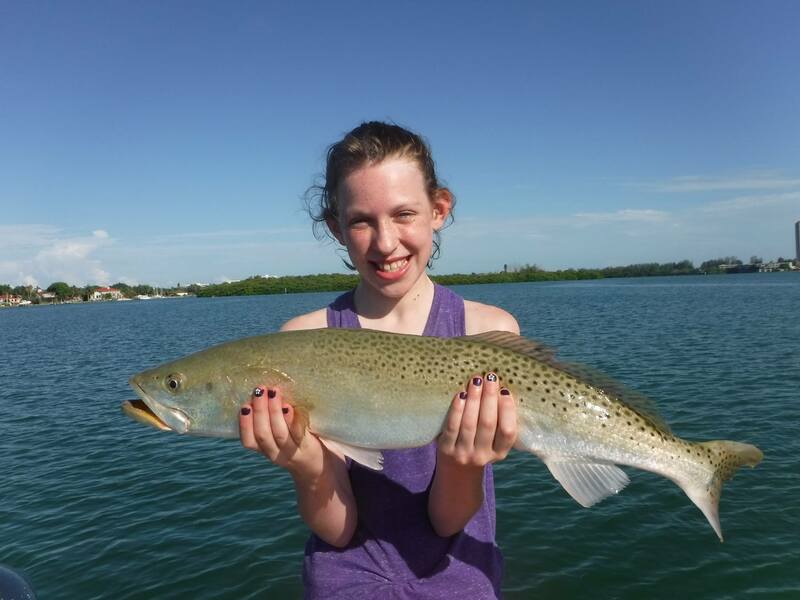 Speckled trout, pompano, Spanish mackerel, bluefish, ladyfish, and more please anglers fishing the flats. Sheepshead, mangrove snapper, gag grouper, and black drum are caught using live shrimp under docks and other structure. 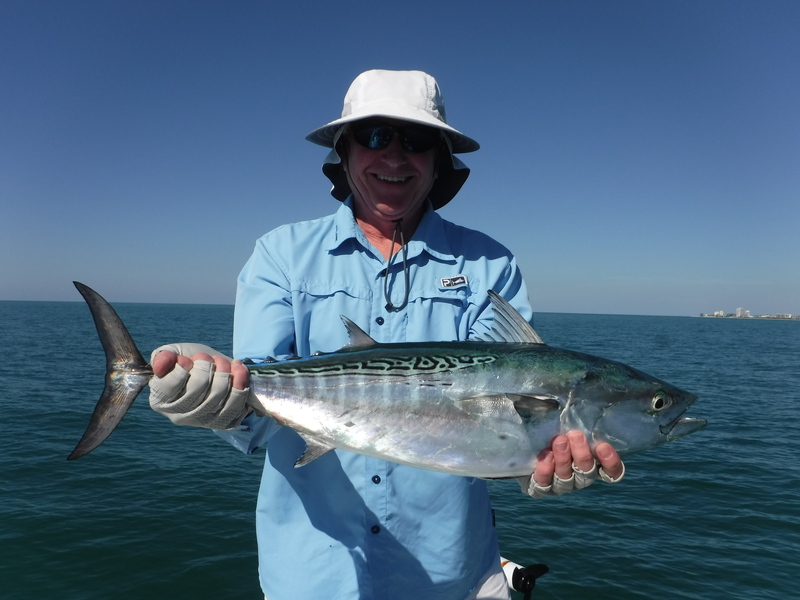 Clich HERE for Capt Jim Klopfer's monthly fishing forecast for Siesta Key. Q: When fishing Siesta Key, is it better to rent a boat or take out a fishing charter? A: It depends on the goals of the fishermen, as well as the number of people going. Renting a pontoon boat is a great option, especially for larger groups with kids. A large boat with a cover and high sides works well for larger groups with more casual anglers. A Siesta Key fishing charter will cost a little more money, but clients will almost certainly catch more fish. As a full time charter boat captain, Jim is out on the water over 200 days a year. That gives him the ability to stay on top of the fish along with having a boat set up to fish. Q: Which works better, live bait or artificial lures? A: Both can be very effective when used in the proper application. Live shrimp are best for more casual anglers who want to cast a bait out and let it do the work. Some species such as sheepshead, are only taken on bait. Anglers fishing structure will usually do best using bait. Lures are a great choice for anglers fishing the beach and who want to move around. Dragging a bucket of shrimp around can be a nuisance. The same goes for anglers fishing from a drifting boat, lures allow them to cover more water. Q: Can visiting anglers keep fish to eat when fishing Siesta Key? A: Yes, they can! Many of the species available are good to eat. It is very important to be aware of the rules and regulations regarding fish species and the size limits, bag limits, and seasons. Fish that are going to be kept should be put on ice right away. Also, fish must be landed whole. This means that fish can not be cleaned until the angler is done fishing and back to the car, dock, or home. Full regulations along with species identification can be found HERE.